DOCO® Athletica City Walker Mesh Harness Reflective is comfortable, light, easy to put on and off, quick drying harness for all dogs. Highly visible reflective stitching night time safety. Specially made for the active dog whether he is exploring woodland, swimming in the sea or pottering around town. Handle on top makes it easy to grab hold of the dog when needed as well as O-ring to click the leash on the dog. 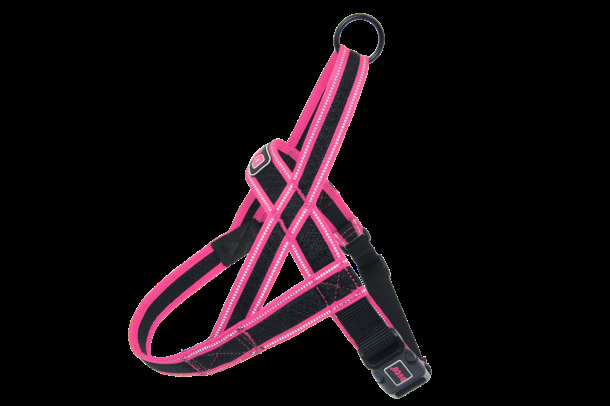 The harness is adjustable around the chest area and there should always be a little daylight around the neckline to allow your dog to move freely. Plastic side buckle on the chest strap that quickly clicks shut and stays put. Designed with adjustable tri-glides on girth straps for fast adjustment and custom fits for different girth sizes. Solid and vibrant colors are easy to see at all times. S/M - 3/4 x 18 20-24"
M - 3/4 x 22 23-28"
M/L - 1 x 24 25-32"
L - 1 x 28 28-36"
L/XL - 1 1/4 x 30 32-39"
XL - 1 1/4 x 33 35-43"